Embodiments of the invention provide a system for enhancing user interaction with objects connected to a network. The system includes a processor, a display screen, a memory coupled to the processor. The memory comprises a database including a list of two or more objects and instructions executable by the processor to display a menu. The menu is associated with at least two independent objects. And the two independent objects are produced by two independent vendors. The present invention is related to electronic communications in a network and more specifically to systems and method for accessing and controlling one or more objects (physical or virtual) such as remote devices and services from a remote location by a user. Electronic devices are frequently used in day to day life. The electronic devices may include television, refrigerator, air conditioners, fans, tube lights, cameras or other electronic equipments such as transmitters, antennas etc. All the electronic devices consume power regularly or at frequent intervals of time. For efficient power consumption, the electronic devices must be controlled or switched ON/OFF. Appliances such as fans, tube lights or microwave may be controlled by regulating the electrical parameters associated with the appliances. For example, a user may control speed of fan, regulate operating power of the microwave as per requirement. However, it requires physical presence of the user to regulate or switch ON/OFF the appliances. A technique for controlling the appliances by a remote control device is well known. The remote control device may transmit signals for controlling the appliances. For example, the remote control device may simultaneously control air conditioners, fans or cameras as per the requirement. However, the technique is limited by location of the user. Moreover, the technique is incapable of updating the real-time status of the appliances to the user. Another available technique discloses a smart device for controlling the appliances. The smart device is configured with internet and connected with the appliances. A user connected with the smart device via the internet may control the appliances from a remote location. Moreover, the user may control the appliances by connecting with processing device via communication channel. The processing device may be located nearby to the smart device and may further receive signals from the user to control the appliances. However, the technique requires installation of a smart device and/or processing device for controlling the appliances from a remote location. Another available technique discloses real-time position monitoring of vehicles. The user may monitor real time coordinates of the vehicles based on the information received from a transmitter located in the vehicle. The user receives the position coordinates from the transmitter via a GPS server 114. However, the user is unable to control or update the positional coordinates of the vehicle as per choice. In light of the above discussion, systems and methods are desired for providing real-time control of the electronic devices and services from a remote location. Embodiments of the invention provide a server for enhancing interaction with Internet of Things. The server includes a processor and a memory coupled to the processor. The memory includes a database comprising one or more options corresponding to each of the things. Further, the memory includes one or more instructions executable by the processor for providing the one or more options to a user for enabling the user to select at least one option therefrom. Further, the memory includes one or more instructions executable by the processor to receive information corresponding to the selection of the at least one option by the user. Furthermore, the memory includes one or more instructions executable by the processor to configure a visual menu based on the received information. Herein, the at least one visual menu may enable a user to control the puarlity of Internet of Things (IoT) devices irrespective of their locations. Hereinbove, the plurality of Internet of Things (IoT) devices consist of a plurality of electronics devices, a plurality of kitchen appliances, a plurality of vehicles, or a combination thereof. Further, the configured visual menu may be stored in the database. Embodiments of the invention further provide a device for enhancing interaction with Internet of Things through a server in a communication network. The device includes a processor and a memory coupled to the processor. The memory includes a database and one or more instructions executable by the processor for accessing one or more options corresponding to each of the things. The one or more options are accessed from the server. Further, the one or more instructions select at least one option from the one or more options. The at least one options is selected to configure a visual menu. Further, in this embodiment, the device may include a display screen to provide the configured visual menu to the user. Further, embodiments of the invention provide a system for enhancing interaction with Internet of Things in a communication network. The system includes a server including one or more options corresponding to the things. Further, the system includes a device communicably coupled to the server through the communication network. The device configured for enabling a user to access the one or more options to select at least one option therefrom. The at least one option is selected to configure a visual menu corresponding to the things. Here, the user is enabled to access the one or more options by authenticating with the server. Additionally, embodiments of the invention provide a server for enhancing interaction with Internet of Things. The server includes a processor and a memory coupled to the processor. The memory includes a database including one or more visual menus corresponding to each of the things. Further, the memory includes one or more instructions executable by the processor for providing a visual menu, from the one or more visual menus, to a user for enabling the user to interact with the visual menu. Further, the one or more instructions provide an enhanced visual menu based on the interaction of the user with the visual menu. Furthermore, the one or more instructions enable the user to interact with the enhanced visual menu to control one or more operations corresponding to the things. Embodiments of the invention provide a system for enhancing interaction of a user with objects connected to a network. The system includes a processor, a display screen, and a memory coupled to the processor. The memory comprises a database including a list of two or more objects and instructions executable by the processor to display a menu on the display screen. The menu is associated with at least two independent objects. Further, the two independent objects are produced by at least two independent vendors. Embodiments of the invention further provide a system for enhancing interaction of a user with objects connected to a network. The system includes a processor, a display screen and a memory coupled to the processor. The memory includes a database comprising a list of one or more objects and instructions executable by the processor to display the objects to the user through the display screen. The menu includes icon which may indicate one object made by a vendor. Further, the icon is substantially different than the one provided by said vendor. Herein, the objects may include at least one of one or more services and one or more remote devices that may be controlled by the user. Further, a service provider (‘vendor’) may provide one or more services that may be utilized by the user by managing the corresponding objects. Further, embodiments of the invention provide a system for enhancing interaction with the Internet of Things. The system includes a processor and a memory coupled to the processor. The memory includes a database including one or more options corresponding to each of the Internet of Things. Further, the memory includes instructions to share at least one of the one or more options with one or more users of the things. Furthermore, the memory includes instructions to receive information corresponding to selection of the at least one option by the one or more users. Additionally, the memory includes instructions to update the database based on the selection of the at least one option by the one or more users. The instructions are executable by the processor. Here, the one or more users may be referred to users of one or more second devices. In an embodiment, a user of a first device (hereinafter may be referred to as ‘first user’) may share the one or more options, corresponding to the Internet of things, with the users of the second devices (hereinafter may be referred to as ‘the second users’). The one or more options may be shared by defining rights for the second users for enabling them to control the Internet of Things. Further, the one or more options may be shared with the second users to enable them to personalize the one or more options according to their preferences. According to the rights defined by the first user, the second users may perform one or more operations, for controlling the Internet of Things, by selecting at least one option from the one or more options. Additionally, the one or more options may be shared for a specific time and on the occurrence of a specific event that may be defined by the first user. The second users may modify the shared one or more options as per their preferences. Further, the first user may be enabled to discard such modifications. Furthermore, embodiments of the invention provide a system for enhancing interaction with the Internet of Things. The system includes a processor and a memory coupled to the processor. The memory includes a database having a visual menu corresponding to the things. Further, the memory includes instructions executable by the processor to share the visual menu with one or more second users of the things. The one or more second users correspond to one or more second devices. Furthermore, the memory includes instructions executable by the processor to translate the visual menu based on one or more preferences of the one or more second users. Additionally, the memory includes Instructions executable by the processor to display the translated visual menu to the second users at the corresponding second devices. Herein, the visual menu is shared with the one or more second users by defining rights for enabling the second users to perform one or more operations corresponding to the things. The one or more operations being performed by selecting one or more icons present in the visual menu. Furthermore, embodiments of the invention provide a device for enhancing interaction with the Internet of Things. The device includes a processor and a memory coupled to the processor. The memory includes a database and instructions executable by the processor. The database includes one or more options corresponding to the things. Further, the instructions share at least one of the one or more options with one or more users of the things. Furthermore, instructions receive information corresponding to selection of the at least one option by the one or more users. Additionally, instructions update the database based on the selection of the at least one option by the one or more users. Herein, the one or more users may be referred to users of one or more second devices. In this embodiment, a user of a first device (hereinafter may be referred to as ‘first user’) may share the one or more options, corresponding to the Internet of things, with the users of the second devices (hereinafter may be referred to as ‘the second users’). The one or more options may be shared by defining rights for the second users for enabling them to control the Internet of Things. Further, the one or more options may be shared with the second users to enable them to personalize the one or more options according to their preferences. Additionally, the memory further includes instructions to receive permission request from the one or more users. The request is received for enabling the one or more users to personalize the at least one option. Embodiments of the invention provide a method for accessing and controlling remote devices in a network. The method includes accessing a database of visual access menus through a graphical user interface (GUI) at a device. Further, the method includes displaying a visual access menu at the device. The visual access menu may include one or more options. The device may include an Internet of Things application such as a VMThings for displaying the visual access menu at the device. The VMThings also enables a user of the device to control the remote devices. The VMThings may be configured to create an Internet of Things menu including representations of recognizable objects. The objects may be physical objects or virtual objects. The Internet of Things menu may be a menu of identifiable objects (physical or virtual objects) connected in an Internet like structure. The user may control the remote devices irrespective of the location of the remote devices through the visual access menu. The user may select an option from the visual access menu. The method further includes displaying an enhanced visual access menu based on a selection of an option received from the user. The enhanced visual access menu may include one or more device options depending on the selection of the option. The device options are representation corresponding to the remote devices. The method further includes receiving a selection of a device option from the user. The method further includes connecting to a remote device based on the selection of the device option. Further, the method includes controlling the one or more operations of the connected remote device based on the selection of the device option. Embodiments of the invention provide a method for accessing and controlling services from a remote location. The method includes accessing, by a user of a device, a database of visual access menus through a graphical user interface (GUI) at the device. Further, the method includes displaying a visual access menu at the device. The visual access menu may include one or more options. The device may include an Internet of Things application i.e. a VMThings for displaying the visual access menu at the device. Further, the VMThings may create an Internet of Things menu including one or more identifiable objects connected to each other in an Internet like structure. The VMThings may display visual access menu at the device to enable the user to control the remote services. The method further includes displaying an enhanced visual access menu based on a selection of an option received from the user. The enhanced visual access menu may include one or more service options depending on the selection of the option. The service options are representation corresponding to the services. The method further includes receiving a selection of a service option from the user. The method further includes connecting to a service based on the selection of the service option. Further, the method includes connecting the device to the service. Furthermore, the method includes controlling and displaying information about the service at the device based on the selection of the service option. Embodiments of the invention also provide a device for accessing and controlling remote devices in a network. 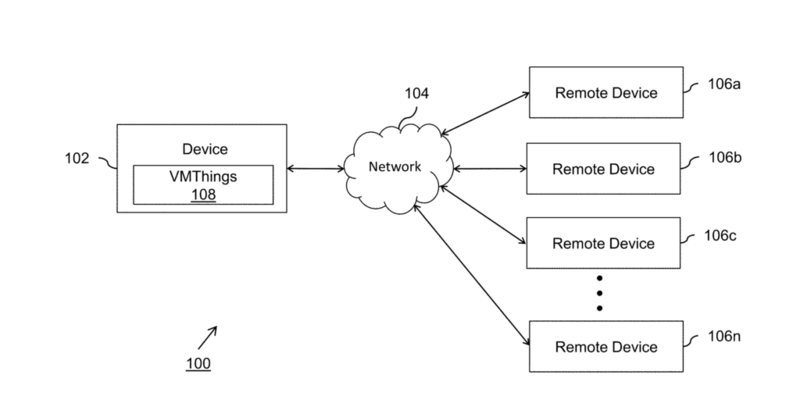 The device may include an Internet of Things application i.e. a VMThings configured to enable a user of the device to access a database including visual access menus through a GUI. Further, the VMThings is configured to create an Internet of Things menu including one or more identifiable objects connected in an Internet like structure. The VMThings may display a visual access menu including one or more options at the device. Further, the VMThings may display an enhanced visual access menu at the device based on a selection of an option received from the user. The enhanced visual access menu may include one or more device options depending on the selection of the option. The device options are representation corresponding to the remote devices. The VMThings may further receive a selection of a device option from the user. The VMThings may also connect the device to a remote device based on the selection of the device option. The VMThings may control one or more operations of the connected remote device based on the selection of the device option. Embodiments of the invention also provide a device for accessing and controlling services in a network from a remote location. The device may include an Internet of Things application such as a VMThings configured to enable a user of the device to access a database including visual access menus through a GUI. The VMThings is also configured to display a visual access menu including one or more options at the device. Further, the VMThings may display an enhanced visual access menu at the device based on a selection of an option received from the user. The enhanced visual access menu may include one or more service options depending on the selection of the option. The service options are representation corresponding to the services located remotely. The VMThings may further receive a selection of a service option from the user. The VMThings may also connect the device to a service based on the selection of the service option. The VMThings may control and display information of the service t the device based on the selection of the service option. Embodiments of the invention also provide a system for accessing and controlling remote devices. The system includes a display device configured to display one or more visual access menus. Further, the system includes an access device connected to the display device. The access device may include an Internet of Things application i.e. a VMThings configured to display the one or more visual access menus including one or more options to control the remote devices, at the display device. The user may create or configure an Internet of Things menu through a Graphical User Interface at the device. In an embodiment of the invention, the VMThings may be configured to create the Internet of Things menu. The VMThings is further configured to enable a user of the access device to access a database including the visual access menus through a GUI. The VMThings may display an enhanced visual access menu at the device based on a selection of an option received from the user. The enhanced visual access menu may include one or more device options depending on the selection of the option. The device options are representation corresponding to the remote devices. The VMThings may further receive a selection of a device option from the user. The VMThings may also connect the device to a remote device based on the selection of the device option. The VMThings may control one or more operations of the connected remote device based on the selection of the device option. Embodiments of the invention also provide a system for accessing and controlling services in a network from a remote location. The system may include a display device configured to display one or more visual access menus. Further, the system may include an access device connected to the display device. The access device may include an Internet of Things application i.e. a VMThings configured to display the one or more visual access menus including one or more options to control the remote devices at the display device. The VMThings is further configured to enable a user of the access device to access a database including the visual access menus through a Graphical User Interface (GUI). The GUI may be used for creating an Internet of Things Menu including a plurality of identifiable objects in a network like structure. The identifiable objects may be physical objects or virtual objects. Further, the VMThings may display an enhanced visual access menu at the device based on a selection of the option received from the user. The enhanced visual access menu may include one or more service options depending on the selection of the option. The service options are representation corresponding to the services. The VMThings may further receive a selection of a service option from the user. The VMThings may also connect the device to a remote device based on the selection of the service option. The VMThings may control and display information about the service based on the selection of the service option. Embodiments of the invention further provide a method for accessing and controlling the remote devices in a network through a web browser. The method includes opening a webpage in the web browser at a device including a VMThings. The method may further include displaying a visual access menu at the device. The VMThings may create or display the visual access menu or an Internet of Things menu at the device. The Internet of Things menu may include a plurality of representations corresponding to identifiable objects. The identifiable objects may be physical objects or virtual objects. The visual access menu may include one or more options. Further, the method includes displaying an enhanced visual access menu at the device based on a selection of an option received from the user. The enhanced visual access menu may include one or more device options depending on the selection of the option. The device options are representation corresponding to the remote devices. The method further includes receiving a selection of a device option from the user. The method further includes connecting to a remote device based on the selection of the device option. Further, the method includes connecting the device to the remote device based on the selection of the device option. Further, the method includes controlling the one or more operations of the connected remote device based on the selection of the device option. Embodiments of the invention further provide a method for accessing and controlling the services in a network through a web browser. The method includes opening a webpage in the web browser at a device including an Internet of Things application i.e. a VMThings. The VMThings is configured to enable a user of the device to access a database including the visual access menus through a GUI. The method further includes displaying a visual access menu at the device. The VMThings may display the visual access menu at the device. The visual access menu may include one or more options. Further, the method includes displaying an enhanced visual access menu at the device based on a selection of an option received from the user. The enhanced visual access menu may include one or more service options depending on the selection of the option. The service options are representation corresponding to the service. The method further includes receiving a selection of a service option from the user. The method further includes connecting to a service based on the selection of the service option. Further, the method includes connecting the device to the remote device based on the selection of the service option. Further, the method includes controlling and displaying the information of the service based on the selection of the service option. An aspect of the invention is to enable a user to control one or more operations of the remote devices or services through voice commands or gestures or hand movements. For example, the user may switch on an air conditioner (AC) by showing a thumb up gesture in front of the device. The device may include a camera to detect the gesture. The VMThings at the device (or access device) may analyze the gesture and control a remote device based on the analysis. An aspect of the invention is to transfer display of a device to another device. The other device may be connected to the device through wireless means. Another aspect of the invention is to create a data base of visual access menus or enhanced visual access menus. The visual access menus or the enhanced visual access menus are the visual menus for controlling one or more objects such as, but are not limited to, remote devices, services, and so forth.